Assuming an absolute number of 17.5 million Jewish people in the world and 6.9 million of them living in the USA, a discussion of The Jews in America seems indispensable in the context of American Cultural Studies. Jewish identity in this context has been approached in a greater focus with a wider public, political and religious discussion of the question “Who is a Jew?”. This question, which is certainly connected to a difficult answer, became a very important factor, especially for the Jews in the USA during the 20th century. 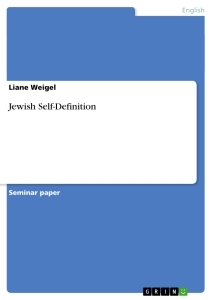 Therefore this paper attempts to analyse the changing Jewish self- definition in the USA during the 20th Century. Although it can or will not answer the complex question, “Who is a Jew?” correctly or in a wider sense completely, it will focus on the development of Jewish continuity and the changes in self-definition in the pluralistic society of the United States during the 20th century. A short acknowledgement on Jewish self- definition and - identification in general will be provided, before facts referring to assimilation, Americanisation and authenticity are discussed. The starting point for the changing Jewish self-definition, which is connected to the immigration at the end of the 19th and the beginning of the 20th century will be analysed in the second part. The Holocaust, the worst genocide of the century, was, especially for the German Jews, a dramatic experience. Besides traumatic feelings, the perception of the Holocaust and anti-Semitism in general mainly influenced the Jewish self- definition of American Jews, referring to the concept of Zionism and Redemption as strictly linked to a concept of hostility towards Jews. Considering the strong sense of self- identification and self- definition of the Jewish people will therefore lead to the third part where the influence of the perception of the Holocaust and anti- Semitism on Jewish self- definition is analysed. The following part will refer to the appearance of revolutionary ideas as usually revealed in the development of almost every people, society or religion. In the USA the influence of a pluralistic society opens possibilities to reform Jewishness and Judaism and results in the emergence of two types of Jews in the 60s and 70s that still dominate American Jewry. The discussion of the future of American Jewry with reference to the question “Who will be a Jew?” concerns Jewish continuity in the next decades. Therefore the fifth part focuses on Jewish future and continuity in America including features of Jewish self- definition. The conclusion will not only summarize the main points of the analysis with emphasis on the fact that Jews are not one homogeneous religious group in the pluralistic society of America. It will also give a prediction of the development of the two Jewish trends that result from this discussion. Before starting with the discussion on immigration, assimilation, Americanisation and authenticity, some features of Jewish self- definition should be mentioned in order to get insight into the Jewish religious tradition since this is important to understand its meaning within Jewishness and Judaism. When, throughout the Middle Ages, Jews constituted their own communities, a strong sense of self-identification enabled Jewish survival despite repeated persecution and expulsions. Some factors important in Jewish self- definition include the following: There are laws and rituals marking the entrance of children into the community, such as the bar mitzvah, and particular laws and customs for adults, such as the observance of the Sabbath, marriage, divorce, and burial in separate cemeteries. Understanding the religious commands of the Torah, the focus of Jewish worship, the maintenance of Hebrew as a sacred language, and the necessity for all Jews to be familiar with it also belong to the principles of Jewish religion. Jewish observance in this respect also refers to the study of the Talmud, which is written in Aramaic, and the maintenance of a separate calendar to determine the observances. Furthermore, a corresponding emphasis on education in general, a positive attitude towards sexuality, birth, and the availability of divorce encourage the family and community life, which is strictly connected to a strong sense of community responsibility. Although individual communities’ standards might vary, a compassionate attitude allowing the re-entry of Jews forcibly baptized and the unification of all Jewish communities according to the Talmudic precepts is very important to clarify the basic self-definition of Jews, seed of Abraham or the “the chosen people” as they often call themselves. fulfils its purpose in the divine scheme of things. Although influenced by the American civilization and the problems of a pluralistic society, “being Jewish” is regarded a whole way of life and not only religious observance. Regarding today’s American Jewry, the American Jewish community is built upon an associational base to a far greater extent than any other in Jewish history. It seems as if it provides more a reflection of a social order that is based on chosen affiliation rather than heritage. But referring to problems of immigration, assimilation and Americanisation, this is a kind of solution to the problems of the “living in a pluralistic society”. In order to understand the problems of Jewish immigrants of the early 20th century towards self- definition, one has to analyse their situation and their development in the United States. This analysis can focus on the aspects of living a life within the framework of the general community, on how to conform to its mores and demands, on what is to do in order to remain different (Jewish), on how to have adjust to American life, on what is happening to American Jews as a result of their integration into the American society, and on to what extent there is a uniqueness of American Jews. When, after the 1870s and 80s, masses of Polish and Russian Jews arrived in the USA, the “old” German immigrants of the 1820s had already got established in the American society. They had fought themselves out of poor beginnings into an acceptable standard of living. A successful participation in the Civil War opens the way to liberalisation of ways of living. Consequently, Americanisation as the height of assimilation was very likely. The new immigrants also had very poor beginnings. Mostly escaped because of religious reasons, they tried to cultivate their Jewish identity in the New World. search of a better life, initially a voluntary process but later made necessary by the events of two world wars. Schuster Adult Publishing Group), p. 71-80. Self- Definition” (2003-09-10). URL: http://www2.kenyon.edu/Projects/Margin/jew.html (2003-09-10). Freedman , Jew vs. Jew: The Struggle for the Soul of American Jewry, p. 1. Daniel J. Elazar, The 1990 Demographic Study: Some Good News; Much Bad News, JCPA (2003-09-10).